Displays the X and Y coordinates on map. Displays X and Y coordinates on map. Place above Blizz's Scripts and Below SDK if you use it and below the default scripts. This will show a window on the map displaying X and Y coordinates. Location = "Upper Right Corner" "Lower Left Corner" "Upper Left Corner" or "Lower Right Corner"
Transparent = "Non Transparent" "Semi-Transparent" "Transparent"
UsePicture = true or false if set to true and transparent = "Non Transparent" it will automatically set it to "Transparent"
LOCATION = "Upper Right Corner"
PICTURENAME = "picture name here"
if LOCATION == "Upper Right Corner"
elsif LOCATION == "Upper Left Corner"
elsif LOCATION == "Lower Right Corner"
if TRANSPARENT == "Non Transparent"
Just requires some customization. Which is in the script. Should be compatible with everything. Its just a little bit of modding from the defual scripts. Place below SDK though. THIS IS MOSTLY FOR DEBUGGING IN CASE YOU NEED SOME X AND Y COORDINATES. Ironically, I see potential in this NOT for debugging. Sure, I can always just go into debug and help me find some secret items or what have you in the map, but simply going into the editor and checking those tiles out are easier and more of a convenience for me. 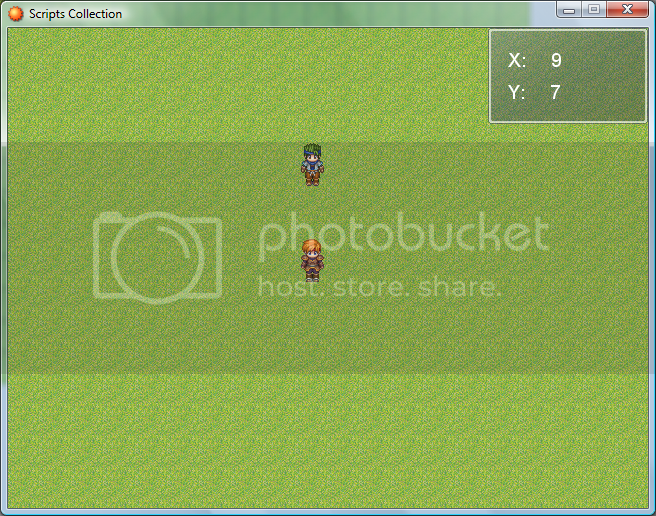 I've added teh $DEBUG already and I am adding the picture customization. I'm back... With lost data and a crashed computer. I very good way to use this is as a treasure finder as you can collect maps and use a tool to get treasure with the displayer. Chronos: Failed project due to loss of data.